Is it possible to cure a broken heart by inventing a game? In this episode, at a place called the Museum of Broken Relationships in Los Angeles, the host of the show meets a young actress named Faith D’Amato, who is trying to recover from a recent breakup with the person she’d thought might have been “the one”. As a result of the encounter, an unusual game is born. 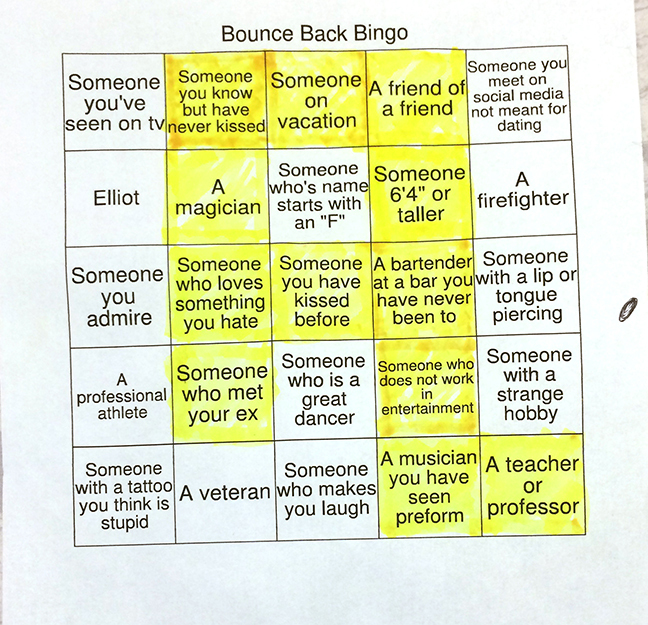 If you want to play the game yourself, you can download your own board to fill out here (http://www.theassignmentbureau.org/kissing_bingo_board/). Independently produced and hosted by Brett Ascarelli. Sound design by Katrine Norild Hedegaard. Music: Theme song composed by Jacek Smolicki and performed by him and Michał Smolicki. Other songs: “Fire” Monplaisir (CC0 1.0 universal), “Let’s Start at the Beginning” Lee Rosevere (CC 4.0), “Quirky Jerk” Jason Shaw (CC 3.0 US), “Rolla” Drake Stafford (CC 4.0 international), “Acoustic guitar of Valentin Sosnitskiy” (CC 3.0). A taste of The Assignment Bureau Podcast, which follows people who are facing challenges by doing creative assignments. Premiers in August 2017.